Why Are Asian-Americans Such Loyal Democrats? In just two decades, Asian-American support for the Democratic presidential candidate more than doubled, from the 31 percent Bill Clinton got in 1992 to the 73 percent cast for President Obama in 2012, according to exit polls. This shift followed the collapse of the Soviet Union and the end of the Cold War, developments that freed anti-Communist Asian immigrants – those with roots in China or Korea, for example – from single-issue ideological concerns that had previously drawn them to the Republican Party. Today, Asian-Americans, a population of 17.2 million, are among the fastest growing constituencies of the Democratic Party. In some ways, Asian-American voters, combining personal wealth, entrepreneurial success, high incomes, traditional family values and a strong work ethic, would seem to be ideal recruits for the more conservative political party. Nonetheless, the Republican Party has steadily lost their support. The accompanying chart, provided by Karthick Ramakrishnan, a professor of public policy and political science at the University of California, Riverside, shows the steady movement of Asian-Americans away from the Republican Party to the Democratic Party. Asian-Americans have the potential to transform the Democratic coalition. They add a large block of voters who combine economic and educational achievement with deeply felt liberal convictions. Asian-Americans are, their vaunted educational and economic successes notwithstanding, a group that has in various contexts experienced differential treatment and a group that in various contexts identifies as a minority group. 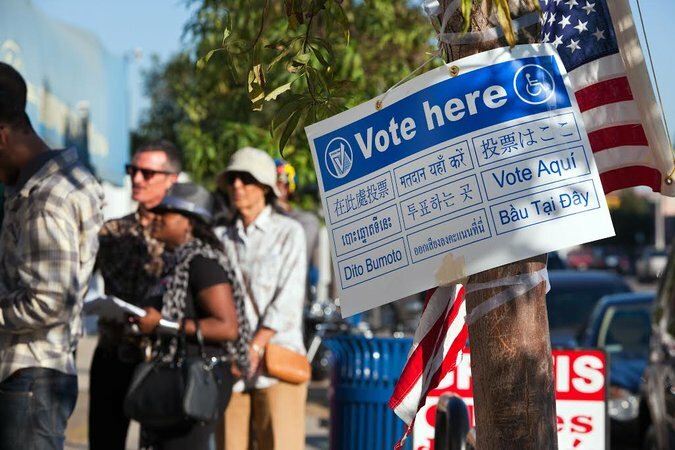 Today’s Asian Americans are not only liberal on the expected issues like health care reform, immigration reform, and educational reform, but they also seem to espouse liberal views across a wide range of unexpected issue areas like environmental politics, affirmative action, and the like. We even find, in our 2012 National Asian American Survey, that nearly 2 out of every 3 Asian Americans who report earning more than $250,000/year supported an approach to reducing the federal budget deficit that would raise taxes on those earning more than $250,000-a-year. There is one issue, race or ethnicity-based affirmative action, on which Asian-American loyalty to the liberal agenda is more conflicted. More than 60 Asian-American groups have filed complaints with the Department of Justice and the Department of Education charging that preferences for African-Americans and Hispanics at Harvard and other selective colleges have reduced the number of Asian- Americans accepted. The complaints are based on the fact that Asian-Americans as a group have substantially higher standardized test scores and grades than competing demographic groups, including whites. The complaints prompted a separate coalition of 135 Asian-American civil rights groups to declare its firm support of affirmative action. The accompanying chart, compiled from data provided by the College Board, shows that college-bound Asian-Americans received the highest average SAT scores in 2015 of any group. The cumulative score on all three SAT tests – critical reading, math and writing – was 1654 (out of a possible 2400) for Asian-Americans, 1576 for whites, 1277 for African-Americans, and 1343 for Mexican-Americans. A 2005 study published in the Social Science Quarterly, “The Opportunity Cost of Admission Preferences at Elite Universities,” by Thomas J. Espenshade, a professor of sociology at Princeton, and Chang Y. Chung, a statistician at Princeton’s Office of Population Research, found that “Asian applicants are the biggest winners if race is no longer considered in admissions” at “three highly selective private research universities” which the authors declined to identify. The Asian share of those accepted at such institutions would grow from 23.7 percent to 31.5 percent, they wrote. Asian-American resistance to race-based affirmative action surfaced in California last year when leaders of the Democratic-controlled State Legislature considered putting a referendum before the voters to restore race-conscious admission policies at public colleges and universities. Asian-American voters flooded legislators with phone calls and emails opposing race-based preferences, prompting three Asian-American Democratic state senators to declare their opposition. Legislative leaders dropped their plans for a statewide referendum. Affirmative action aside, support for the liberal agenda is solid among the broad population of Asian-Americans. Asian Americans tend to support a strong social safety net and stronger role for government in everyday life. The political liberalism of Americans of Asian descent is notable given their affluence, success in the marketplace and the high status of jobs they hold. In 2014, median household income for Asian-Americans was $74,297; for whites, $60,256; for Hispanics, $42,491; and for African-Americans, $35,398. Three out of five in the Asian-American work force have a college degree, compared with 37 percent of whites, 27 percent of African-Americans and 18 percent of Hispanics. Fifty percent of Asian-Americans have managerial or professional jobs, compared with 39 percent of whites, 29 percent of African-Americans and 20 percent of Hispanics. Asian-Americans also stand apart from other Americans of all races and ethnicities in family structure. The percent of out-of-wedlock births among Asian-Americas in 2013 was 17 percent, just over half the 29.3 percent rate for whites and far below the 53.2 rate for Hispanics and the 71.5 percent rate for African-Americans. The work ethic is robust among Asian-Americans, who believe by 42 points (69-27) that “most people can get ahead if they’re willing to work hard.” Among all American adults, it’s a much smaller 18 points (58-40). On the divisive issue of abortion, Asian-Americans are more liberal than the general electorate. By 17 points (54-37), Asian-Americans believe abortions should be legal in most or all cases, compared with an eight point spread (51-43) in the general public, according to the Pew Research Center. What can we make of all this data? There are a few preliminary inferences. The first is that despite their affluence, Asian-Americans are on course to become a mainstay of what Stan Greenberg, the Democratic pollster, calls the “rising American electorate”: the liberal alliance of black and Hispanic minorities, single women and young voters. In this respect, Asian-Americans are similar to another minority voting group with strong Democratic ties, American Jews. They, too, have incomes and educations well above average. The Pew Research Center found that 42 percent of Jewish households had an income of $100,000 or more, compared with 18 percent of all American households. Along similar lines, 58 percent of Jews have college degrees, compared with 29 percent of the entire population. Jewish support for Democrats is similar to that of Asian-Americans. According to Pew, 70 percent of Jews identify themselves as Democrats or lean toward the Democratic Party, and 22 percent are Republican or lean Republican. Asian-Americans share with blacks, Hispanics and Jews an experience of previously marginalized status and social exclusion. These four constituencies also share a belief that a commitment to hard work and self-reliance does not conflict with a belief in a strong government and a reliable safety net. Such views stand in direct contrast to those of the Tea Party and Wall Street wings of the Republican Party, both of which see self-reliance and big government as antithetical to each other. It may prove that the values that Asian-Americans, Jews, blacks and Hispanics share will create sufficient cohesion to sustain a liberal coalition, even as some members of the coalition fail to ascend the socioeconomic ladder in lockstep with the others. That is the current conundrum of the upstairs-downstairs American left. Their Republican adversaries, who have themselves fielded a multiracial and multiethnic set of presidential candidates, are determined to fight fire with fire, as they claim to be the party most committed to upward mobility. When voters go to the polls a year from now, these Republican claims will be tested as never before.